Background and Source: Laccase belongs to the blue multi-copper oxidases, which are widely distributed in fungi and higher plants. It is present in Ascomycetes, Deuteromycetes, and Basidiomycetes and found abundantly in white-rot fungi. Applications: Laccase enzymes because of their potential have acquired more importance and application in the area of textile, pulp and paper, and food industry. Recently, it is being used in developing biosensors for detection and removal of toxic pollutants, designing of biofuel cells and medical diagnostics tool. Laccase is also being used as a bioremediation agent as they have been found potent enough in cleaning up herbicides pesticides and certain explosives in soil. Because of having the ability to oxidize phenolic, non-phenolic lignin-related compounds and highly fractious environmental pollutants, laccases have drawn the attention of researchers in the last few decades. Commercially, laccases have been used to determine the difference between codeine and morphine, produce ethanol and are also being employed in de-lignify woody tissues. We have revised patents related to applicability of laccases. We have revised all the patents related to its wide applicability. Conclusion: For fulfillment of these wide applications, one of the major concerns is to develop a system for efficient production of these enzymes at a broad scale. Research in the field of laccases has been accelerated because of its wide diversity, utility, and enzymology. 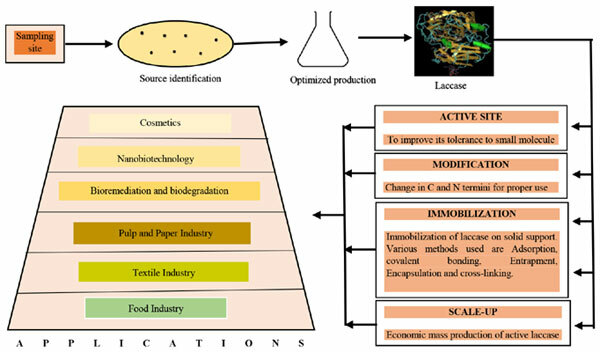 This paper deals with recent trends in implementation of the laccases in all practical possibilities with the help of optimizing various parameters and techniques which are responsible for mass production of the enzyme in industries. Laccase, enzyme, de-lignify, bioremediation, enzymology, multi-copper oxidases.